Trying to figure out how to leave your car in the garage more often and spend less time behind the wheel? The answer might just be a cargo bike. Cargo bikes have been around since the early 20th century and were originally used by tradesmen to deliver goods before the invention of the automobile. Nowadays, they are extremely popular in Europe and Asia and are used for both recreational and business purposes: taking kids to school, transporting groceries, family bike rides, and for delivering mail and packages. Using cargo bikes can cut down on noise and air pollution. They can be quicker than using cars or delivery vans. Finding parking is also not as difficult in the city. Of course, there is also the health benefit to riding a bike. It is a great way to get in shape! Despite their practicality, cargo bikes are less frequently used in North America, although they are slowly starting to catch on in the United States. UPS, which started in Seattle in 1907 as a bicycle messenger company, announced last year that it would start using electric cargo bicycles to deliver packages in Pike Place Market and downtown Seattle in order to reduce congestion. Denverite Melissa Colonno is a huge fan of cargo bikes and bought hers in October 2017. While living in Seattle from 2008-2012, Melissa and her husband biked a lot and remember seeing several longtail cargo bikes. Around the time their first child arrived in 2012, Melissa started seeing Madsen (a US brand) “bucket bikes” on social media and immediately wanted one. As her family grew, Melissa tried out various ways to transport her children. “When our first child was around one year old, we bought a Yepp bike seat to bike with her around Denver. This worked well. Then, when we were about to have our second child, we bought a Chariot stroller that could also be a bike trailer. 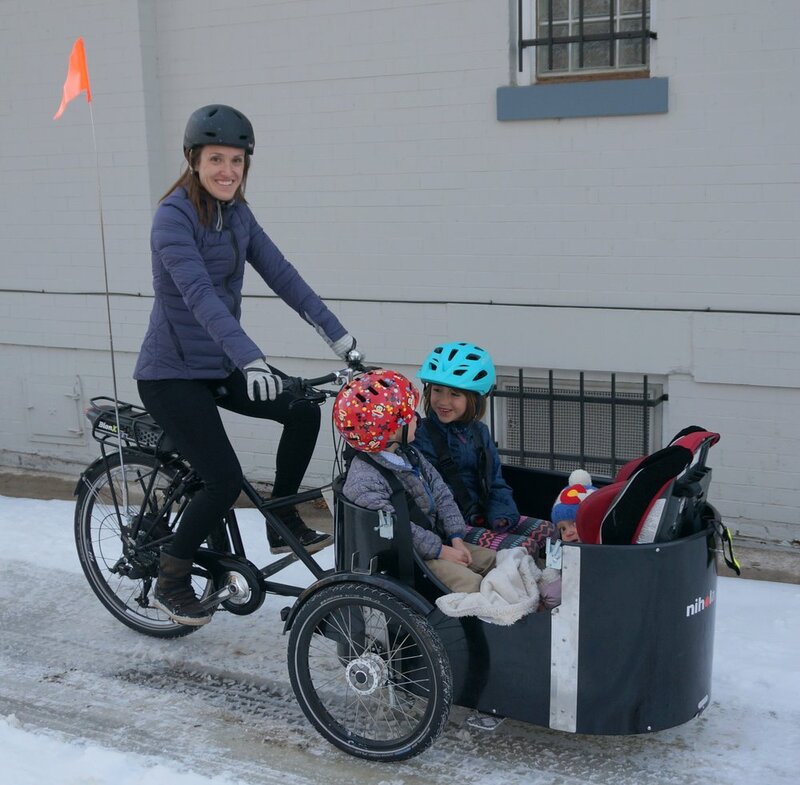 We used this frequently to bike with our two kids.” Melissa has always been intrigued by cargo bikes and once she was pregnant with her third child, she became even more resolved to get one! When it came time to buy a cargo bike, Melissa and her husband did more research and decided they wanted a tricycle with the cargo box in the front. She wanted to feel very stable while riding and stopping and wanted to be able to see her kids without having to turn around. Melissa ordered a Nihola 4.0 with a BionX e-assist from a bike shop in Sacramento, California called from Practical Cycles. They import Niholas from Copenhagen, Denmark. The Nihola is unique among trikes in that the steering is independent of the cargo, meaning that you do not have to move the weight of the cargo to steer; Melissa adds that is not difficult to ride or steer. It maneuvers very much like a “regular” bike. However, it might not have quite the same speed and maneuverability as an inline (two wheeled) cargo bike. People who are used to high-speed road bikes may prefer an inline cargo bike to a trike. Since her cargo bike has an electric assist, she can go plenty fast if necessary, but usually she goes slower to stay safe and enjoy the ride. The Nihola 4.0 has two bench seats which easily fit four children. The maximum load of the cargo box is 265 pounds. There are two Y-harnesses and a lap belt. Both benches are removable, so they currently have one bench removed so that their youngest can sit in a car seat for extra support. Why choose a cargo bike over a trailer? Melissa says that a trailer worked well enough for transporting her kids. However, a cargo bike is far superior in her opinion. The bike is always ready to go since you do not have to deal with hooking the trailer to the bike. In a cargo bike, the kids are closer to the rider, and usually have a better view of the things around them, which makes the riding experience more enjoyable. Also, trailers get very heavy to pull as the weight of your children increases. Owning a cargo bike has dramatically affected her car use. She is driving significantly less since purchasing her cargo bike. Her goal is to bike anywhere within a three-mile radius unless the roads are too icy, or there is another safety concern. Since Melissa and her family live near downtown Denver, they can get to many things by bike! Melissa uses her cargo bike regularly to transport her two oldest kids to and from school, but they use it for many other purposes, too! She frequently uses the cargo bike to run errands; it fits all her family’s groceries! She uses the bike anytime they go somewhere that is just a bit too far to walk. If Melissa and her husband are going to the park for a picnic, they will take the cargo bike, so they can transport their food and lawn chairs. Basically, they use it for carrying all kinds of cargo! She’s often amazed that biking to places does not take that much longer than driving, and you rarely have to worry about parking! Most importantly, biking makes for a much more enjoyable journey. Generally, people are really excited when they see the cargo bike according to Melissa. They get a lot of stares and some comments; almost always positive. People often say things like “nice set-up!” or “can I get a ride?” Occasionally, people will ask more specifics about where they got it or what the brand is. Melissa tries to “sell” one to everyone who is interested! If you are interested in buying a cargo bike, you should definitely do your research. There are many websites, Facebook groups, and bike shops that can provide advice. Depending on how you plan to use your bike and what type of cargo you want to carry, there are many options from utility bikes to cargo tricycles to electric cargo bikes. New bikes are coming out all the time, so there is definitely a good option for everyone. A cargo bike is a financial investment; but much cheaper than a car! Melissa Colonno is the author of DELIBERATE.LESS. She provides day-to-day tips on reducing household waste and creating a life that strives to be less hectic. Melissa is passionate about decreasing her family’s waste and environmental footprint by making informed and intentional choices. Melissa holds educational sessions about reducing household waste to individuals, school groups, and professionals.